I remember the gagging rancidity of soap on my tongue. I can’t recall the words I’d muttered, or perhaps it had to do with the way those words were said, but I can still taste the bitter effects. Directed by my Mom who stood next to the sink, quiet, hands on hips, it was self-delivered punishment. I spit the last of it into the sink and shuddered. My father-in-law, a former literature teacher and lover of words used to shake his head at society’s use of profanity and crass words. “The English language is so rich why would people need to resort to cheap speech?” He’d say. With the political scene as it is, people are talking about talking. “I mean who doesn’t cuss now and then?” Someone recently said to me. The lady speaking went on to defend extending grace, and I left uncomfortable with an incongruous mixture of truth and lies. Because what comes out of our mouths is a problem. It matters because it reveals what’s inside. Jesus, The Word, Logos, made Flesh, taught about speech, its tendency toward vitriol and the need for purity, for ongoing transformation. When our family moved to Italy and went through the agony of language learning, our children were fluent long before me. It was the oddest thing to have a seven-year-old, four-year-old and two-year-old blabbering away and I had no control or understanding of what they said. One Sunday morning, out of the mouth of the youngest of our three, flew an Italian bad word in Sunday school. She spoke it innocently, because words flowed from her mouth like an Italian fountain from some place inside that collected what she heard and spoke them into being. It was like a baby that mimics sounds before understanding comes. The teacher was mad at her, chastising with undistinguishable sounds that formed the Italian language. We had never heard our daughter’s bad word before she spoke it. “It’s not in the dictionary,” was my husband’s perplexed response. Her word was disconnected from her heart, yet she still remembers the awful evil feeling she had of doing something really wicked. When God’s holiness invades our inner sanctum through Christ, we cannot continue to pitch our tents in the cesspool of habitual verbal contamination. Our fountain flows distinguished from the world, a clear spring. It’s true that we aren’t going to reach perfection and yes we need to extend grace, but we also have within us the Holy Spirit. We are set apart. Changed. Speech peppered with dung should leave a very bad taste in our mouths. Cleansed hearts pour out graced words. 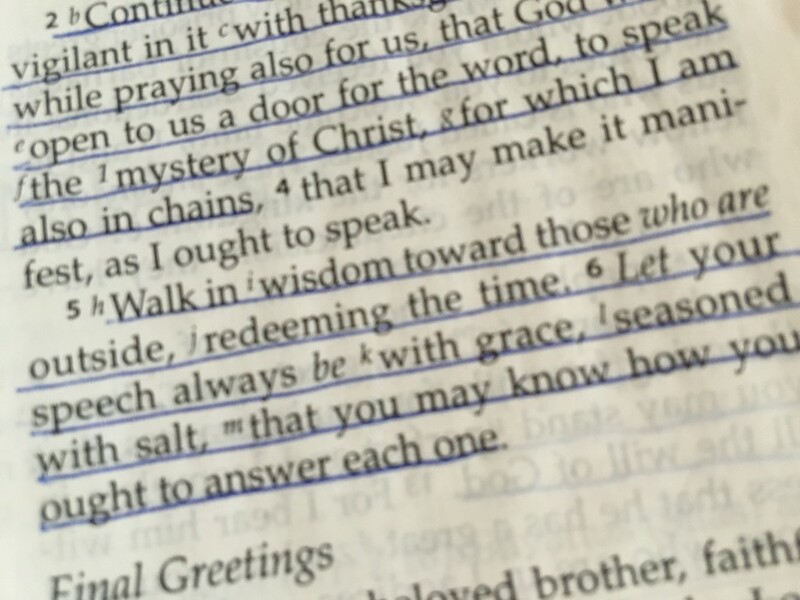 “….but rather thanksgiving.” Ephesians 4:4. Syl, I read words I don’t recognize when I get the privilege to read your post! I love the dictionary. If only I could remember. Just a few minutes ago I was talking to my son about the choice of our words and what they tell about what’s on the inside. I couldn’t agree with you more!! I didn’t know Mr. Schroeder loved words. I remember him as our O.T. and N. T. Bible teacher our freshman and sophomore years at Berean. I’m in awe concerning God’s GREAT MERCY and GRACE in my life. May you have a fantastic day serving our LORD!! Thanks Marilyn. I always appreciate your encouragement! Enjoyed. Great thoughts. Right living. Bible passage in introduction caught my attention and I opened to read, but would love to know the reference! When we become His dwelling place, I believe we cannot pitch our tents in any cesspool!! Thanks Dorcas, I appreciate your comments! The passage is in Colossians 4 (NKJV). Colossians 4:5-6 In the photo!! Caught my attention because of the word “outsiders” -such a lost truth as even in speech many try to convince others that being a “believer” makes no difference. Reminds me of Peter who cursed in fear when accused of being one of the Lord’s followers. Thanks! !